Home / Posts tagged "private photography tours"
A successful Iceland private photography tour has ended so this was Special Sunday for us. It was our 46th wedding anniversary day. We had planned to be at a special location photographing the Northern Lights around 16:00 but as the day was a little lazy day we arrived there at 20:00. It was pitch dark and we could not see the waterfalls only hear the water running. No light from houses, street lamps or even from a car. We took our camera gear out of the car, headlights on and walked ever so slowly to the place we had decided would be a good spot. It was a tricky photography challenge. There weren´t any strong dancing Northern Lights, and it was pitch dark. We decided to light paint the waterfalls if the slightest Northern Lights would show themselves. Slowly they appeared but there were clouds as well. In addition, there were trees in front of the viewing platform we were standing on. We were ready with the light to paint the waterfall. We were shooting a little bit in the blind. The end result was satisfying for us on this photography tour. A tour just for us. We put on our wide-angle Nikkor 14-24 mm on our Nikon D810. Here are our settings: aperture priority, ISO 1600, aperture to 2.8, exposure compensation +4 and exposed for 15 to 30 seconds. Tripod RRS. In Iceland, they are good as we often have heavy wind. We drove home only wishing that our customers on Iceland private photography tour had been with us so they also would have enjoyed this magnificent experience. But dealing with the northern lights you never know when or if they will show themselves at that particular spot we are in. 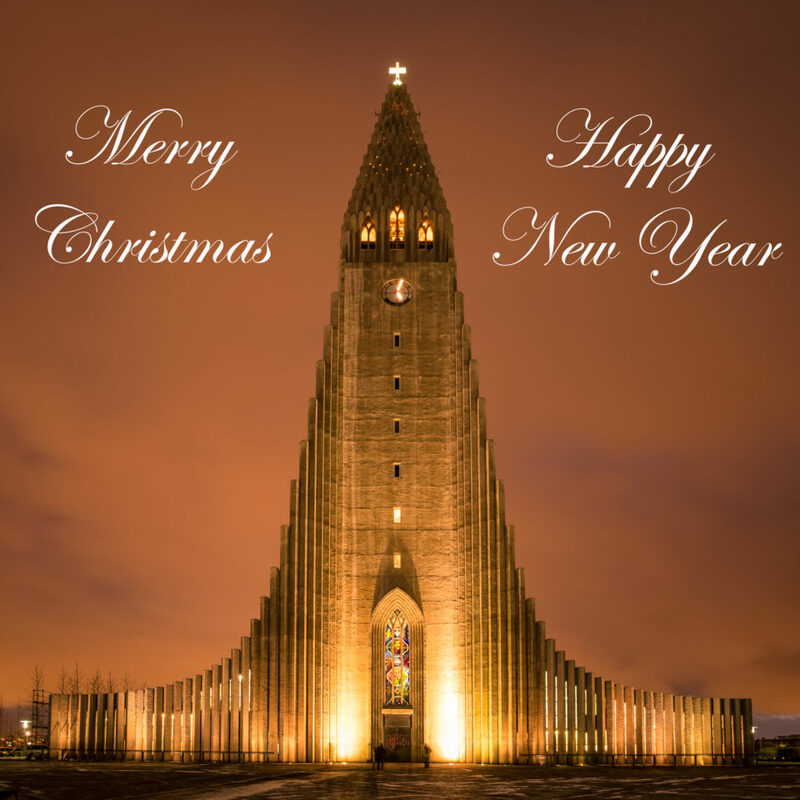 We wish you all a Merry Christmas and happy new year. We can really say Merry Christmas and happy new year as for us the year has been one more extraordinary year. Ordinary in one sense of the word i.e. a lot of routine but it has also been extra. It has been a special year to remember. First and foremost everyone in the family has been healthy and we have enjoyed a lot of time together. Our friends and customers have also been a rich source of joy. A big thank you to our customers for enriching our lives. Our customers tend to become our friends. On our long intensive photography tours we go through thick and thin, sweet and sour. We did a number of long photography tours with customers this year and a lot of one day tours. As one happy and eventful year comes to an end we ask ourselves if life can really go on like this. Can it really be this one big everlasting adventure? Yes it can if we have objectives and take good care of our body, soul, family and friends. It is a matter of how we allocate our time and energy. Take time to train your bodies, cultivate positive thinking, spend time with family and visit friends. Already we have a number of photography tours with customers being lined up. We plan to bicycle 4-6 weeks April/May in North America and visit South Africa in August/September. 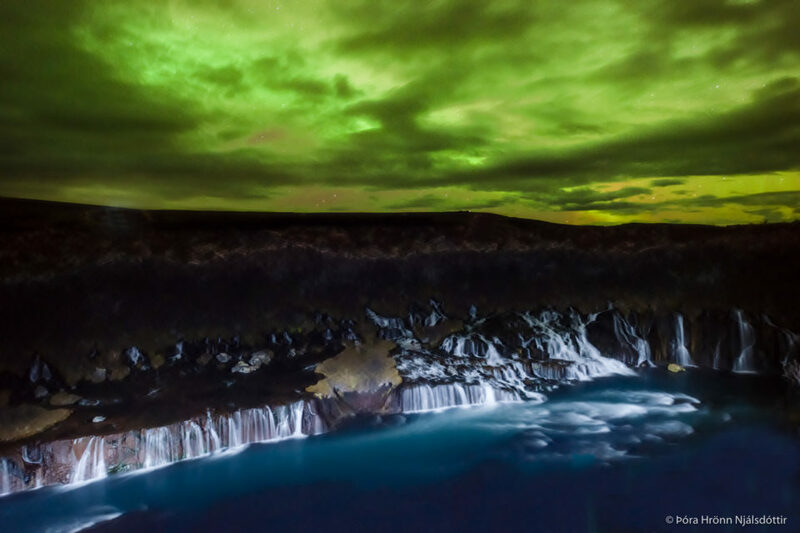 We are Photo Tours in Iceland a tour operator. Come with us and explore Iceland and enjoy life. The name of the beautiful bird in the picture is Arctic tern (Sterna paradisaea). The Icelandic name is Kría. We admire this bird for how strongly they protect and look after their chicks. As a result of this when photographing them nesting you need to have some protection. For instance a cap on your head or a stick that is higher than yourself as the terns are really aggressive. The bird in the picture is somehow posing for the camera. 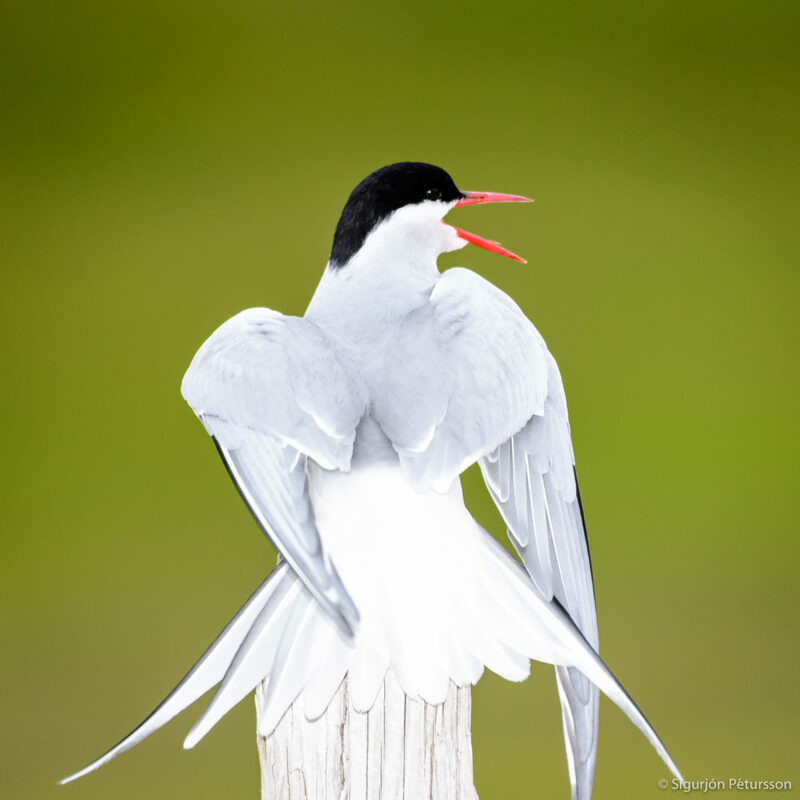 The Arctic terns are medium-sized birds. Colouring is mainly grey and white plumaged. They have red/orangish beak and feet, white forehead, black nape and crown streaked with white and white cheeks. Arctic terns are long-lived birds. Consequently a lot of them reach fifteen to thirty years of age. Their food is mainly fish and small marine creatures. The species is abundant, with an estimated one million individuals. While the trend in the number of individuals in the species as whole is not known. However exploitation in the past has reduced this bird’s numbers in the southern reaches of range. The Arctic tern flies a long way in its migration and life. Recent tracking studies have shown average annual coverage of lengths of 70.900 km for birds nesting in Iceland and Greenland and 90.000 km for birds nesting in the Netherlands. The bird in the photo breeds in Iceland. In the fall it flies all the way to the Antarctica. The longest migrations known in the animal kingdom are those of the Arctic Tern. The Arctic tern flies as well as glides through the air. They nest once every one to three years. When the birds have finished nesting they take to the sky for another long southern migration. We are a tour operator. We organise Bird Photography Tours. So come with us. Reykjanes Power is working on the Iceland Deep Drilling Project at the Reykjanes Peninsula in Iceland. On the 25th of January 2017 at 4,659 meters depth it reached a milestone. Temperature at the bottom of the well has already measured at 427°C, with fluid pressure of 340 bars. 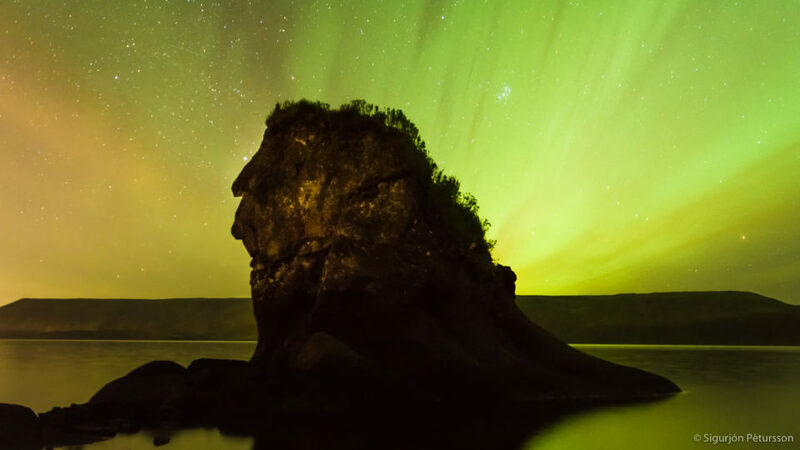 The National Energy Authority of Iceland (Orkustofnun)(OS) and four of Iceland’s leading energy companies: Hitaveita Sudurnesja (HS), Landsvirkjun, Orkuveita Reykjavíkur and Mannvit Engineering established this project called “Deep Vision” (IDDP). The aim is to improve the economics of geothermal energy production. The strategy is to look at the usefulness of supercritical hydrothermal fluids as an economic energy source. In conclusion this will make it possible to tap the temperatures of more than 400 °C (750 °F) by drilling to depths greater than 4.000 meters. The drilling is at a rifted plate margin on the mid-oceanic ridge. Producing steam from a well in a reservoir hotter than 450 °C (840 °F) — at a proposed rate of around 0.67 cubic metres per second (24 cu ft/s) should be sufficient to generate around 45 MW. As a result of that the project could be a major step towards developing high-temperature geothermal resources. “Deep Vision” recognised at its inception that much research would be needed. Funding has come from the members of the consortium. The International Continental Scientific Drilling Program and the US National Science Foundation have contributed funding as well. Researchers from UC Davis, UC Riverside, Stanford University, and the University of Oregon have taken the opportunity to collaborate with IDDP. They have aimed their investigation to gain information about extracting energy from hot rocks on land. We operate Daily Photography Tours to the Reykjanes Peninsula. 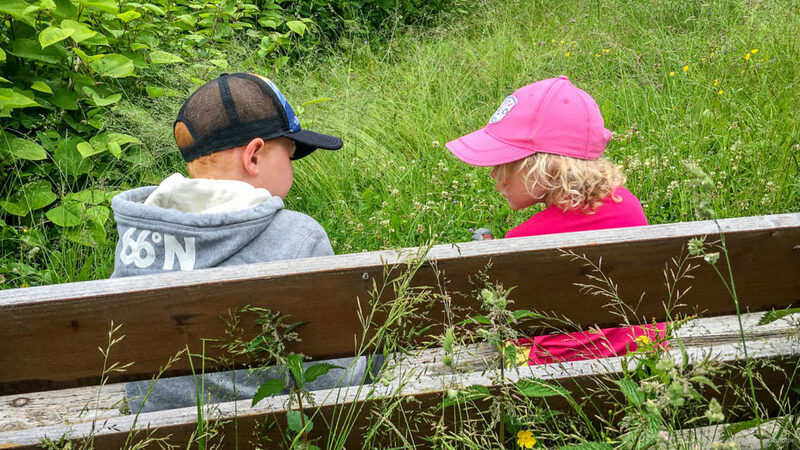 We had the good fortune to spend four days with our grandchildren in Chamonix, France last summer. If there is anything that makes our heart go faster and our smile broader it is spending time with them. We were hiking in the mountains and they saw this bench and sat down to rest. What they were talking about I don´t know. I could not resist grabbing my iPhone 6+ which is always very close to me and take this picture. The iPhone is a lot of the time your best camera as it is the camera you have with you when you see and grab the moment. This moment that is just like a spark in the fire. Lasts a moment. 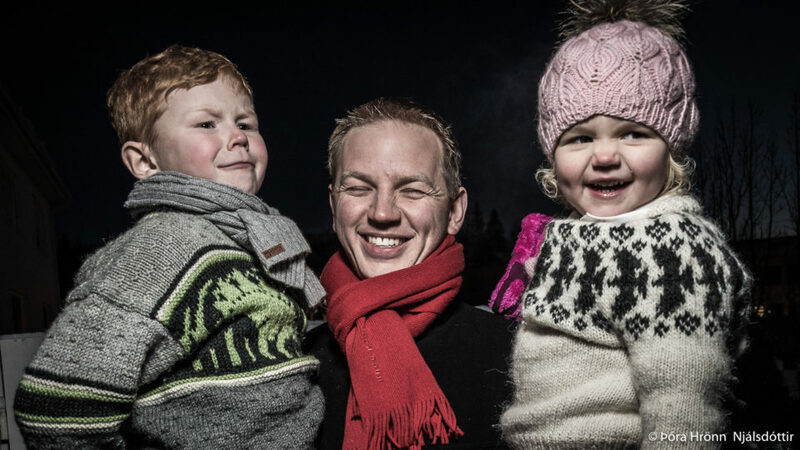 Why don’t you bring your family to Iceland? We can organise the tour of your life. The Importance of precious time with family. Today I was reminded that it is two years since I photographed my older son and grandchildren. It was none other than google+ that was the reminder. It feels like yesterday that I took this photograph. An even stronger feeling is that almost forty years ago my son was born. Time goes really fast. Let us all use it wisely and try every day to be the best of ourselves. In-fact, time is more valuable than money. Time is very valuable partly for the reason that we are all only allotted a certain amount of time in our lives, and so we need to make sure that we use it wisely. Nothing can stop the flow of time. Time once past cannot be brought back by any means. However, some people do not realise the value of time and spend it unwisely. Instead of focusing on important tasks at hand, they waste their time, thinking that they would make up the loss in the future. They should realise that many of the future troubles can be avoided by taking prompt action in a timely manner. The famous proverb, “a stitch in time saves nine“, also highlights the importance of sorting out problem at early stage. 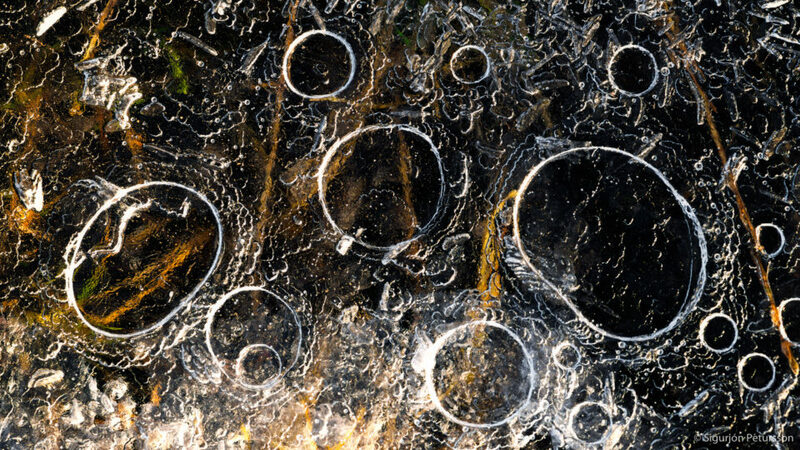 The beauty of winter in Iceland often is reflected in the ice bubbles bu. We do not need to travel far and wide to capture beauty. These bubbles were at my feet on the beach. Often I had walked that path and not noticed. In photography one of the keys to a good photograph is to go slow and notice the little beautiful things around you. In our times everything goes so fast so take it slow and see the beauty around us. Photography is a bit like writing. When done alone we can better take our own time to contemplate. Just sit down and take in the surroundings. No pressure of time or form others around you. Therefore we like private photography tours. No fixed schedule or pressure from a big group. Just we and no one else. 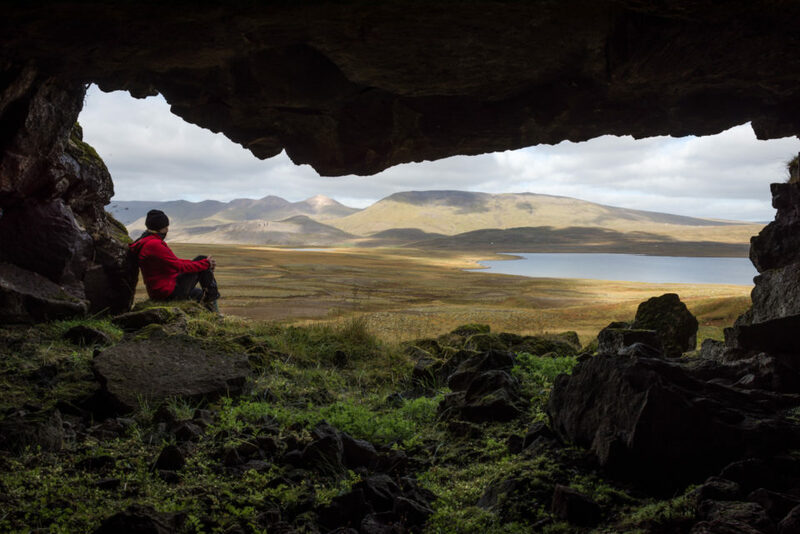 Gudnahellir Cave is one of the locations we have lately been photographing on a photo project for the 90 year anniversary book project for the Iceland Touring Association. The book covers the Mosfellsheidi moor. When you think of it the Mosfellsheidi moor is just a few minutes drive from our home. There are so many things and places there to see we never knew of. Take this cave for instance. Gudnahellir cave. We did not know about its existance. Mosfellsheiði is a plateau in the southwest of Iceland between Mosfellsbær and Þingvellir. It is part of the Highland of Iceland. Let us show you and photograph the many caves and ice caves in Iceland. The Indian Head is a rock on the Kleifarvatn lake just 20 km from Reykjavik. As winter has arrived we have shorter days and longer nights with darkness. But we have also candlelights and coziness so it is a bit of an effort to go out and photograph the Northern lights. The other night was very good for Northern lights with a Kp value of almost 9. Golden opportunity to go out and catch some Northern Lights. So I headed out to the Indian Head on the Kleifarvatn lake. I had my Nikon D810 on a tripod with 24-70mm lens, ISO 800, 24mm f/2,8 and 13 sec. I was quite satisfied when I came back home 2 hours later. Come and photograph Northern Lights with us. The Phantom 4 drone opens up a lot of new possibilities in photography and video i.e. Droneography. 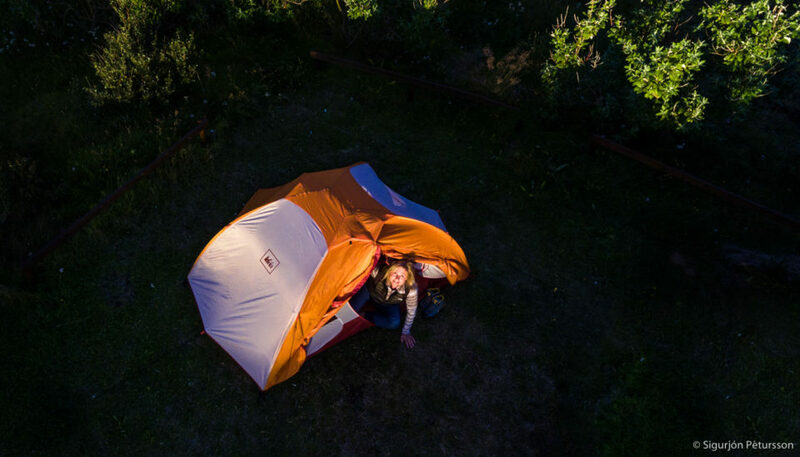 I shot this with the drone at sunset in Melrakkasletta, Northeast Iceland as the midnight sun shone on our tent. On our two week trip to the Northeast Iceland last week I only photographed and made videos with the drone. It was a revelation to see the land from this new perspective. It always is. All of a sudden big vistas open up that we could never record before. We are still learning to see. Now we need to see from the air before we launch the drone. This is a completely new way of pre visualising. The Icelandic horse is known for its soft and sweet nature. Consequently it is popular with children. On a photo tour in North Iceland we visited the Gardshorn horse breeding farm. 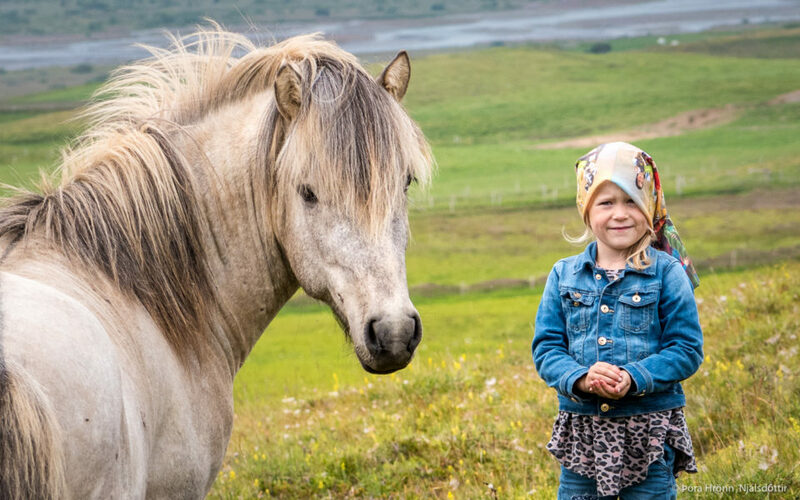 There we photographed beautiful horses and this lovely little lady of the house Ylva Sól. The Icelandic horse is a unique breed of smallish horses that came to Iceland with the first settlers from Norway 1100 years ago. Archeological digs in Europe have revealed that it is descendent from an ancient breed of horses. This breed is extinct outside of Iceland, where it has been preserved in isolation. The Icelandic, as it is commonly referred to, is known for being sure-footed and able to cross rough terrain. Especially relevant it displays two gaits in addition to the typical walk, trot, and canter/gallop commonly displayed by other breeds. The first additional gait is a four-beat lateral ambling gait called tölt. The breed also performs a pace called skeið, or “flying pace”. Skeið is used in pacing races. It is fast and smooth, with some horses able to reach up to 50 km/h (30 mph). It is not a gait for long-distance travel. The Icelandic horse comes in many different colours. The Icelandic language includes more than 100 names for the various colours and color patterns. It is small, weighing between 330 and 380 kilograms (730 and 840 lb) and standing an average of 132 to 142 cm (52 to 56 inches) high. It has a spirited temperament and a large personality. We can organise special horse photography tours. 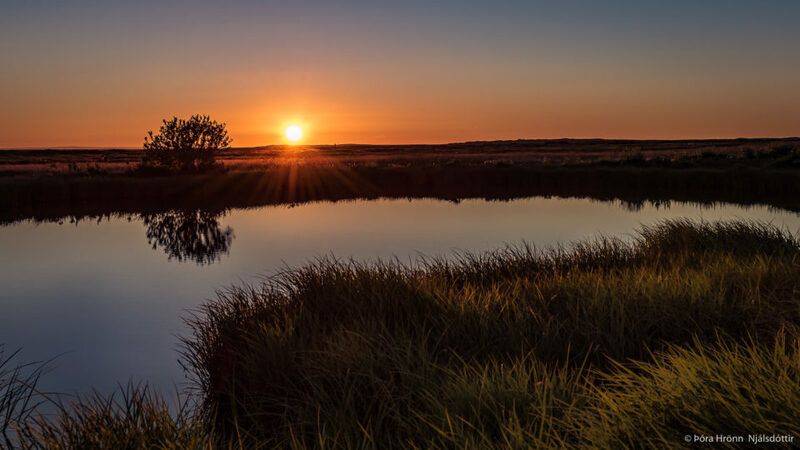 Midsummer nights in Iceland such as this one make you not want to go to sleep at all. During summer we have very long days and hardly any nights. Sunset takes place during the night and the sun rises during the night. In some places the sun does not set at all. This photo we took with on iPhone in the highlands in Northeast Iceland at the Grimsstadir farm. It is the most isolated farm in Iceland. Here also in most winters the lowest temperatures are reached. It get very very cold reaching lower than -20°C. Close by is the Dettifoss waterfall the most powerful waterfall in Europe. We love travelling into this area for photography during winter.